Paul Hawken initiated a research project that had never been done before: the goal was to find the most impactful solutions to reverse global warming based on quantifiable data. This body of work, summarized in the book Drawdown, ranks the solutions based on the amount of greenhouse gases removed from the atmosphere. Food waste comes in third place, with an estimated reduction of 70.53 gigatons of CO2 (Hawken, 2017). The impact of food waste on the environment begins with farming itself. Conventional farming has proven to be detrimental to the environment, requiring massive clear cutting, excessive resources such as water, harmful pesticides, and fertilizers, and the extensive use of machines. Additionally, a significant amount of energy is used to run the factories and machines that process food. Transportation of food also creates a large carbon footprint. People often purchase foods like bananas from Ecuador, rice from Cambodia, and coffee from Ethiopia without knowing how far away their foods are coming from. These items travel long distances, emitting a significant amount of greenhouse gases along the way. Next, the food is taken to a supermarket where refrigeration coolants are used in abundance to keep the food cool and fresh. The problem with this, however, is that harmful chemicals such as hydrofluorocarbons are released which warm the atmosphere at a rate 1,000-9,000 times greater than carbon dioxide (Hawken, 2017). There is another aspect of food waste that has proven to be very destructive to the atmosphere. Approximately 40% of food in the United States ends up in the landfill which produces extremely high amounts of methane. (USDA, 2013). The anaerobic conditions in the landfill stimulate the growth of methane producing bacteria (EPA, 2017). Methane is approximately 30 times more potent as a heat trapping gas than carbon dioxide (Princeton University, 2014). Currently there is not sufficient data available to quantify the methane released from food waste in landfill, and therefore, it is not reflected in Hawken’s final data. But without a doubt, the number of greenhouse gases produced due to food waste is much higher than quantified in the book. Both low-income and high-income countries have issues with food waste, however the reasons are different. In low-income countries the majority of food loss occurs primarily during production, transportation, or even in the fields. They often do not have the resources and infrastructure in place for preserving produce and keeping it fresh, and therefore it is often inedible by the time it reaches the consumer. In higher income countries, food waste occurs closer to the retail and consumer end of the cycle. Many consumers will only purchase fruits and vegetables without blemishes, prompting restaurants and grocery stores to reject produce that is perfectly healthy to eat. Additionally, in affluent communities, food establishments often over-order food to ensure they will have enough inventory to keep customers satisfied. People have also become less inclined to eat leftovers, which results in large percentages of food being thrown away. Most of this uneaten food travels to the landfill and produces methane gas which further perpetuates the cycle of global warming. By reducing food waste as Paul Hawken’s book Drawdown proposes, 70.53 gigatons of CO2 could be reduced from the atmosphere (Hawken, 2017). Solutions posed in the book Drawdown give me hope that there are ways we can successfully ease and even reverse global warming. Good News for Fairfax Residents! A small, green kitchen counter compost container was delivered to each Fairfax resident last November. Put your food scraps in the container and then dump the contents into your green curbside cart each week. You will reduce the amount of food waste in the landfills in Marin, and become part of the solution to climate change. Learn more about the program here. Hawken, P. (2017). Drawdown: the most comprehensive plan ever proposed to reverse global warming. New York, NY: Penguin Books. Carbon sequestration is a foreign concept to many, including myself. That being said, it is a very important part of sustainability and it is a process that can help reverse the harmful effects of global warming if adopted across the planet. Global warming is caused by the increase of greenhouse gases in the atmosphere. Carbon dioxide, a common greenhouse gas, is released into the atmosphere when we drive our cars, use electricity from nonrenewable sources, heat our homes or cut down our forests. The increase of greenhouse gases in the atmosphere causes detrimental problems like ocean acidification, an increase in droughts and wildfires, stronger hurricanes, and sea-level rise. Problems such as these are the reason we need solutions that will take carbon dioxide out of the atmosphere and return it into the earth. We need innovations that will connect the environment, economy, and politics together. There is one thing for sure: something has to change. I started by looking at the Marin Carbon Project. The Marin Carbon Project (“MCP”) is an organization that works to “enhance carbon sequestration” in different types of soils. In a general sense, carbon sequestration is a process in which carbon dioxide is taken from the atmosphere and is stored in other biogeochemical cycles. The MCP wants the farmers of Marin to be pioneers in carbon sequestration techniques so we can start reversing climate change. They currently have eight carbon farms in Marin but in the next three years, they plan to have more than twenty. Their carbon sequestration methods are not easy to understand, but according to MCP, “by increasing the amount of photosynthetically captured carbon held, or sequestered, in long-term carbon pools on the farm or ranch, including soil organic matter, perennial plant roots and standing woody biomass, Carbon Farming results in a direct reduction in the amount of carbon dioxide in the atmosphere.” Their techniques are on the cutting edge of carbon sequestration. I interviewed John Wick, who co-founded the MCP. Wick has worked in the area of carbon sequestration for over ten years and is a rancher in West Marin. He worked with scientists at UC Berkeley to quantify the phenomenon of carbon sequestration as he needed to determine what it would take to both cool the planet while feeding and clothing more than seven billion people, a nearly impossible task. Wick observed success in shifting the vegetation species composition from invasive annual grasses to deeper-rooted native perennials, and thought that it allowed the soil to take more carbon. He needed a scientific protocol for measurement. UC Berkeley scientists found that a topical application of compost changed the way the soil behaved, as plants turned atmospheric carbon into new carbohydrates through the natural process of photosynthesis, taking in more and more carbon as time went on. Wick also stressed the importance of the grass, and talked about how grazing by both wild and domesticated animals is a critical aspect of soil carbon sequestration. At the end of our interview he left me with a few facts, and one really stood out to me. Currently, the Intergovernmental Panel on Climate Change agree that emission reduction will no longer help slow climate change, so we must develop a strategy of ongoing atmospheric carbon removal that is sustainable. This is exactly what the Marin Carbon Project has achieved! You can learn more about MCP at http://www.marincarbonproject.org. Another source of inspiration on climate change is the recent book Drawdown by Paul Hawken. Drawdown is a collection of one hundred most effective ways we can combat global warming. The word “drawdown,” in particular, pertains to reducing atmospheric carbon in various ways including carbon sequestration. In his book, he talks about the importance of composting. Composting prevents food from going into the landfills where it will decompose slowly and produce methane, a greenhouse gas more potent than carbon dioxide. Composting also returns carbon back into the soil: this is crucial. According to Hawken, composting could reduce 2.28 gigatons of carbon dioxide by 2050. I find composting both an eco-friendly and self-satisfactory process. We bring a lot of our food scraps to our chickens, peacocks, and other fowl. It’s great to see how we both return the carbon back into the earth and feed the birds with our waste. It’s important that we all play our part in reducing atmospheric carbon. Protection of our coastal wetlands is another important way to sequester carbon, according to Hawken. Living in Marin, we have beautiful coastal wetlands all around us. These delicate ecosystems hold billions of tons of carbon dioxide. Humans have notoriously destroyed the environment for thousands of years and, according to Hawken, the more we destroy our coastal wetlands, the more carbon will be released into the atmosphere each year. Coastal wetlands are a huge source for sequestering carbon and destroying them would not only destroy habitat for millions of organisms, but it would also deepen the effects of global warming. According to Hawken, 1.2-2.4% of the sequestration of carbon in the world occur in these vital ecosystems. The organisms and flora of the coastal wetlands work together to create a “carbon sink” and take carbon away from the atmosphere. Moreover, it is not only coastal wetlands that have a huge impact on carbon sequestration but it is also different ecosystems around the world like estuaries and rainforests that are so vital to carbon sequestration. I implore everyone to make sure we don’t harm these beautiful and potentially earth saving ecosystems. To learn more about Drawdown visit http://www.drawdown.org. My time learning about carbon sequestration from the MCP, Wick and Hawken has shown me that we can reverse climate change and global warming. Global warming isn’t just a thing that should be adapted to, it should be a thing that should be solved. Wick cleverly used a Warren Buffett quote and applied it to carbon: Buffett’s two most important rules in gaining wealth are to “never lose money” and to create compounding interest situations. Wick claims that we need to do the same thing with carbon. If we never lose carbon from the soil, we can create a compounding interest conditions that increase through use. We need to return carbon to the soil. Wick left me with a hopeful thought: he said, the one thing that everyone can do to help carbon sequestration is to compost everything that comes from living sources. We need to work hard to find creative solutions like carbon sequestration and fund climate research and projects that scale-up the solutions. Empowering the public to do their part in composting and providing farmers with the knowledge and the tools to implement carbon sequestration practices are essential to keep “drawingdown” atmospheric carbon. Action should also be taken at the political level, such as advocating for tax incentives for carbon negative farms. Reversing global warming will take a variety of strategies, as there is no one solution. Marin is a unique and beautiful place and if we want the future communities of Marin to enjoy it as we do, we must act! 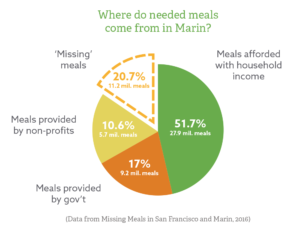 Youth Blog: Hunger in Marin- What Can You Do? Despite being one of the wealthiest counties in the nation, Marin County has a widespread population of people who are food insecure. Food insecurity is the state of living without reliable access to a sufficient quantity of affordable, nutritious food. Food insecurity is having to choose between impossible decisions like having the food you need or having shelter and a place to live. There are nearly 50,000 people in Marin County who are food insecure, and worry about where their next meal is coming from. In Marin, over 16,000 seniors are food insecure. Many seniors have a difficult time getting access to fresh produce and affording nutritious foods. In a recent survey of 3,000 seniors, 46% report running out of money for food each month. On top of this, 3,500 seniors over 65 have annual incomes below the Federal Poverty Level of $11,670. 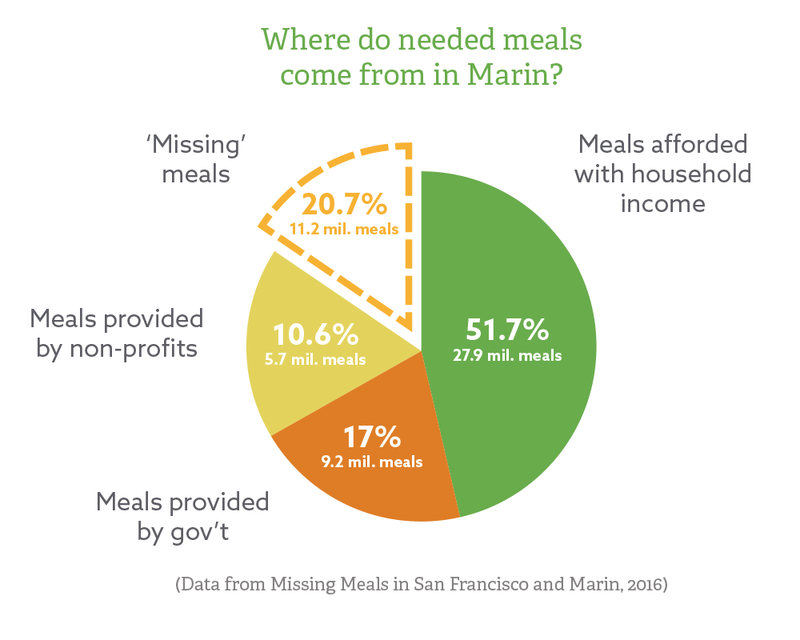 These alarming and distressing facts demand change and require community effort to ensure that everyone in Marin has access to fresh, healthy, nutritious foods. Zauderer decided to tackle the issue of food waste and food insecurity by creating a system to recover fresh healthy food that would normally go to waste and dona te it to someone in need. ExtraFood picks up excess fresh foods from organizations and businesses and delivers them immediately to various nonprofits that serve Marin’s population of hungry people. The foods that they deliver include fresh produce, prepared food, eggs, meat, dairy, packaged goods, and baked goods. According to Zauderer, “ExtraFood delivers food to more than 5,000 people per month to over 80 different sites around the county.” In three years of operation, ExtraFood has delivered over 900,000 pounds of food collected from over 150 donors to almost 83 different sites in Marin. This includes 13 new food programs they have started with their partners to expand the safety net further. ExtraFood has made 11,000 deliveries and continues to regularly supply food to Marin County. Zauderer explains that every donation counts, even the smallest contribution can make a difference. 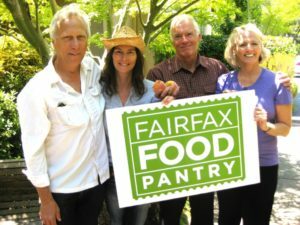 Another local organization working to take action against hunger in Marin is The Fairfax Food Pantry, co-founded by Holly Bragman. Bragman helped create The Fairfax Food Pantry in 2011 because she noticed that there was a need for this service in the Fairfax community: 25% of the participants of the San Geronimo Valley Community Center Food Pantry were from Fairfax. Bragman decided to open up the Food Pantry in Fairfax because transportation is often very difficult for people who are food insecure, and this new location would provide more central access to healthy nutritious foods. Located in the Fairfax Community Church, The Fairfax Food Pantry feeds over 130 families every week. 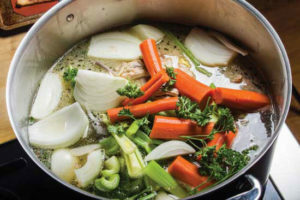 According to Bragman, “the Pantry receives donations totaling 5,000 to 8,000 pounds of food per week.” These foods mainly include protein like meat, fresh veggies, fruit, and other staples for the everyday kitchen. If they have extra food at the end, they often give it to other locations or organizations like St. Vincent’s. Bragman’s vision is to act locally, helping the community through a system that includes Fairfax Volunteers, the Town of Fairfax, and the Fairfax Community Church to create an easy and accessible way for people to obtain healthy, fresh foods. Together we can help solve hunger in our local community by making small changes to our consumer behavior, and making a conscious effort to help those in need. 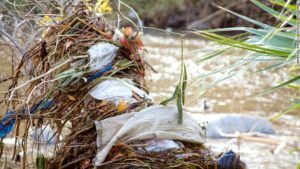 Youth Blog: Get informed about the Plastic Bag Ban Propositions! We often hear about how Americans buy too many products we quickly dispose of or don’t really need. However, many overlook the wastefulness of the packaging and transport of the products we buy. The amount of single-use plastic bags we consume is no small issue; in fact, the United States goes through over 100 billion plastic bags annually. Plastic bags put an enormous burden on our environment and our wildlife. We use 12 million barrels of oil every year to produce the number of bags we use in this country. Plastic bags are responsible for the death of over 100,000 sea creatures when these animals mistake them as food. On top of that, plastic doesn’t biodegrade, it only photodegrades, meaning it will break up into extremely small pieces resembling dust but it will still be harmful to the environment. With this ominous and foreboding status of plastic bag use today, it seems like reducing or stopping their production and use is unsurmountable. When looking at this issue as a whole, it can seem overwhelming and hopeless. We must focus on how to change our plastic bag use at the individual, local, state and eventually national level. With the upcoming election this November 8th, I urge you to take a stand against the use of plastic bags and take a stand for our earth. Two years ago in 2014, California passed the first statewide single-use plastic bag ban in the nation, following the lead of cities and towns all over the state (Sustainable Fairfax initiated one of the first successful plastic bag bans in the country here in Fairfax!). Plastic bag companies from all over the country were distressed that they would lose their biggest consumer of plastic bags. So they hastily challenged this law and placed Proposition 67 and 65 on the November 8th ballot in an effort to complicate, distract, and repeal the existing law. Proposition 67 puts the California statewide single-use plastic bag ban before the voters, as the result of a referendum on the law sought by the American Progressive Bag Alliance, a coalition of plastic manufacturers. Proposition 67, if passed, would essentially eliminate the use of single-use plastic bags, as well as charge a 10¢ fee for any reusable or paper bag. Prop 67 would give the money collected from the 10¢ bag fee to the grocer. This way, the grocer could use the 10¢ to help abide with the new law requiring them to use more expensive reusable or paper bags. According to Jessica Connolly, the Recycling Programs Coordinator for Marin Sanitary Service, reusable plastic bags are up to “five times more expensive” to make (a reusable plastic bag is defined as being able to carry 25 pounds across a football field 125 times!) For this reason, plastic bag companies are strongly opposed to the plastic bag ban, and spent $2.9M to oppose Proposition 67. Proposition 65 is an initiative that was also placed on the ballot by the American Progressive Bag Alliance. If the plastic bag ban passes, this law would demand that the money collected from the 10¢ bag fee be directed into a California State environmental fund. What could be wrong with that? Not so fast. Many believe this poorly written law was put on the ballot by the plastic industry to confuse voters. Since the grocers would be required to give the money to the State, the plastic bag ban opponents could challenge the law by claiming that the bag fee is actually a tax. Tax measures need a 2/3 majority vote to pass, rather than the 50 percent simple majority needed for initiatives. If Prop 65 gets more votes than Prop 67, but doesn’t get 2/3 of the vote, it likely will be challenged and repealed in court, thereby eliminating any plastic bag ban. For plastic bag ban proponents, the hope is that people will become accustomed to bringing their own reusable bags. According to Mark Squire, owner of Good Earth Natural Foods, they have never given out plastic bags at checkout and initiated a fee for paper bags years ago. He believes that the bag fee serves as an effective reminder for his environmentally conscious customers to bring their own bag when they can. Squire has seen a steady increase in the use of reusable bags, which is currently at about half and half. In short, to ensure that single-use plastic bags are banned from our state, it is important to vote YES on Proposition 67. And vote NO on Proposition 65. I believe the plastic industry is misleading the public about what is best for the grocers, the environment, and the consumers and are only looking out for themselves. Help protect our earth, you have the power to make a difference! 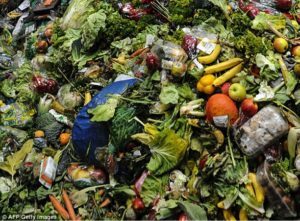 Youth Blog: Give Your Food Waste A New Life! I am a youth intern for Sustainable Fairfax. Recently I have worked on the Town of Fairfax’s zero waste initiative. Fairfax has a goal to divert 94% of the waste from landfill by 2020, five years ahead of Marin County. Keeping food waste out of the landfill is vital in order for Fairfax to reach that goal, considering food waste makes up 30% of landfill waste. 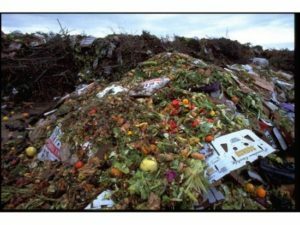 Decomposing food in the landfill generates large amounts of methane, which is21 times more powerful than carbon dioxide. Globally, 50-70 million tonnes of methaneis produced from the landfill each year; this is a significant amount we can decrease. Marin Sanitary Service has been working with the Town of Fairfax and Sustainable Fairfax to tackle the food waste problem at the commercial and residential levels. Thanks to Kim Scheibly of Marin Sanitary I received insider information about services they provide for businesses and residents to reduce landfill waste. Businesses: Ms. Scheibly explained how businesses can decrease the food waste sent to landfill by participating in the Food 2 Energy program which uses a bio-digester to convert food waste to energy. The biofuel produced goes to powering the wastewater management services provided by the Central Marin Sanitation Agency. Food 2 Energy is paid for by business customers based on the size of their bin and number of collections, just like garbage. However, the cost for the Food 2 Energy collection service is over 50% less than the cost of the garbage service. This program is very popular with Fairfax businesses and has received positive feedback. So far Fairfax’s Mana Bowl, Peri’s, Cafe Lotus, Miyoko’s Kitchen, Sorella Cafe, Grilly’s, Red Boy Pizza, Coffee Roastery, Hummingbird, Taste Kitchen and Table and Ghiringhellis Pizza have committed to this sustainable initiative. According to Ms. Scheibly, there has been positive feedback from all of the business customers. As a bonus, Fairfax residents participating in curbside composting can save money on their garbage bill by converting to a smaller landfill cart. Residents also benefit from the free compost deliveries made by Marin Sanitary to the Fairfax Pavilion parking lot several times a year pursuant to the franchise agreement with the Town; sign up for the Sustainable Fairfax e-newsletter to be notified of these deliveries. There has been success with this diversion strategy according to Ms. Scheibly who reported many residents converting from 64 gallon to 32 gallon landfill containers. Twenty gallon landfill carts are also available. It is important to note that all food items should be disposed of in the green cart, including meat, bones, and dairy products. The high temperature used in commercial composting allows these materials to break down quickly, unlike the process for backyard composting. Soiled paper, pizza boxes, napkins and paper towels can also go in the green bins. Unfortunately compostable plastics must be disposed of in your landfill cart, because these materials do not break down fast enough for commercial compost in Marin. Marin Sanitary is currently working to expand multi-family curbside composting. I worked with Sustainable Fairfax on outreach to multi-family homes. The feedback and data collected ensured the system was working and we received positive feedback from all of the apartment complexes we visited. Marin Sanitary and Sustainable Fairfax continue to do outreach to educate residents about composting to help reach Fairfax’s diversion goal. As a senior in Drake High School’s environmental studies academy SEA-DISC, one of my many activities is an internship with the local non-profit organization Sustainable Fairfax. Recently I have been working with Sustainable Fairfax on their water program, conducting interviews with various experts on water use, waste water, and watersheds in Marin County and getting a great perspective on these issues. Along the way I also discovered a few other exciting projects that are leading the way to sustainability in Marin. At the Sky Oaks Watershed Headquarters near Lake Lagunitas, stewards of the watershed face daily challenges to ensure that the land stays healthy in order to provide enough clean water for the region’s water demands. Removing non-native scotch broom and preventing pollution are regular tasks, but a challenge most aren’t aware of is the threat of wildfire to our water supply. According to Mike Swezy, the Watershed Lands Manager at Sky Oaks, fire is one of the main concerns for the health of our watershed. 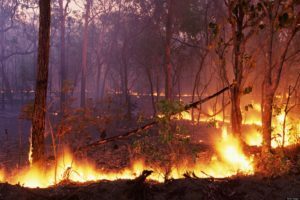 Fires not only change the scheme of an ecosystem on the large and visible scale but even at the molecular level. According to a 2004 Colorado State University article in the Journal of Forestry, high soil temperatures consume the layer of leaf litter and organic material on the surface of the soil which causes a physical change in the charged particles of the soil, creating a “tin roof” effect; the soil actually repels water and it runs off quickly. Burns, whether prescribed or naturally-occurring, also prompt a type of erosion called dry ravel, in which dry soil and rocks slide downhill without any precipitation moving it. And, exposed soil without any plants to shield it or roots to hold it washes away in heavy rains. Accelerated erosion fills streams with sediment, which has a negative impact on the clarity and quality of water.